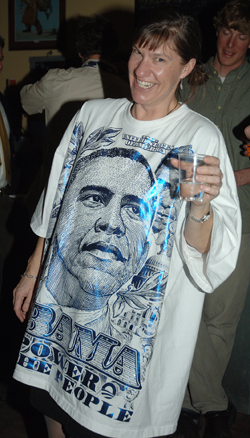 Sporting a recently purchased shirt from New Orleans, Kristine Bretall of Hailey personified the local, regional and national excitement of President Obama’s inauguration Tuesday evening at a celebratory party at the Mint in Hailey. “I am thrilled to have been a small part of a remarkable event in American history,” Bretall said. Approximately 200 people attended the gala event.